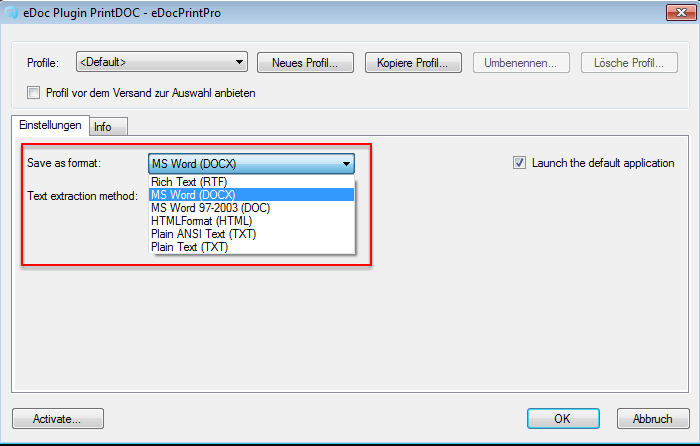 The PrintDOC eDocPrintPro Plugin makes it possible to create a MS-Word text file – DOC, DOCX, RTF, TXT or HTML via printing process from any application. With that it’s e.g. possible to edit or add text to an offer or invoice belatadly. Or the printout of an internet page through the browser can be saved as word document and then added to another document. Thereby the original layout remains the same as far as possible. 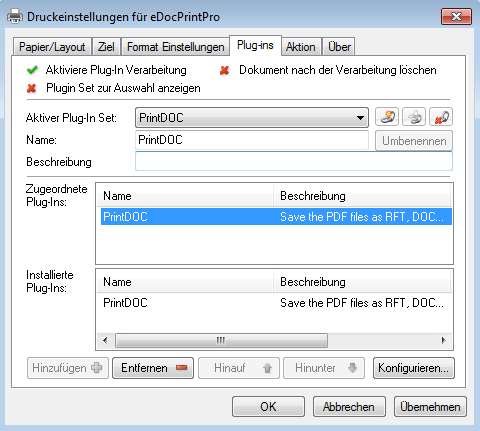 Therefor the edited file can be outputted as PDF again afterwards. Caution: An existing PDF file shouldn’t be printed again via the Acrobat Reader but converted to the MS-Word format directly by drag & dopping it into the eDocPrintPro DropZone. By printing a PDF file again with the PDF printer driver the text content could get unusable. Therefor the direct way over the DropZone is preferable for already existing PDF’s.